Link back and thank the person/s who gave you the award. Award 15 other bloggers and leave them a note telling them about the award. 1. "Aya" is not my legit nickname. It's just my screen name (sort of). Haha. It's still derived from my first name though, so I guess it's still legit. But I'm not used being called "Aya" by people I know for real. 4. I don't like halo-halo. If you don't know what halo-halo is, it's basically a really popular dessert here in the Philippines. 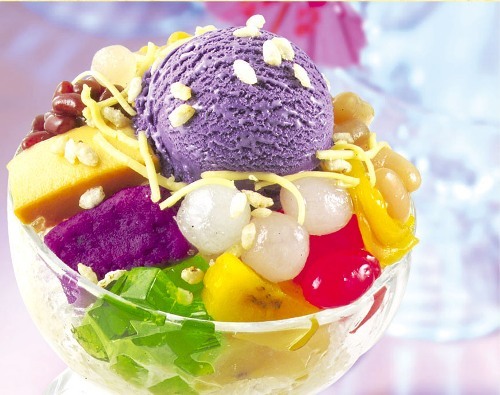 Halo-halo = shaved ice + beans + fruits + lots more. Halo (halò) means mix... you get the idea :) I eat halo-halo but I don't particularly like it and I don't find myself craving for it ever. 6. When I was younger, I remember not liking wearing slippers. Me and my sister loved walking around the house barefoot. My parents, of course, did not tolerate that so we eventually got over the habit. 7. I like listening to one song over and over again. Some people find it annoying (especially when I'm on loud speakers. LOL). But seriously, when I find a song I really really like, I can loop that song over and over again and not get sick of it. So there you have it! I hope you enjoyed those random sharings. I am sharing this award to the following people. Thank you Aya! Will add this on my post soon. :) mama used to scold me aswell if I don't wear my slippers at home. congrats dear! thanks for the tag. i want to do this tag but... blogger won't let me post and i can't get a hang of the email thingie hahaha! congrats aya! thanks for tagging me this award. really appreciate it. Do you use Google Chrome? Maybe the screwy posting is just limited to that browser? I'm on Firefox and posting is just fine for me. @Iya, no prob dear. Haha especially now that there are many Koreans here in the Philippines, no?